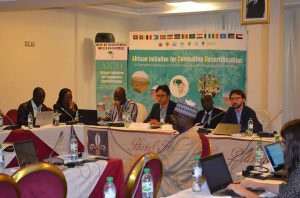 Dakar, Senegal – What are the best practices in countries in the Sahel region when it comes to combating desertification and enhancing resilience to climate change? Seven countries showcased their best practices at an event from August 28-30 in the capital of Senegal funded by the Japan International Cooperation Agency (JICA) who was part of the jury along with delegates from CILSS, CSE, FAO, GEF, SOS Sahel, and ICARDA to evaluate the best practices submitted. 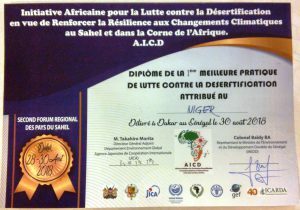 The “best practice contest” jury was tasked to select practices with high scaling potential in the Sahel, in the frame of the African Initiative for Combating Desertification (AI-CD). Contributions were submitted from Senegal (anti-salt micro-dams), Burkina Faso (zai – pits dug during preseason to catch water and concentrate compost), Cameroun (stone bunds), Mauritania (sand dune fixation), Niger (assisted natural restoration), Nigeria (measures to secure drinkable water availability), and Chad (composting). After thorough discussion and consideration, the jury announced Niger as the winner having presented a practice assessed to have the highest dissemination potential in Sahel and the Horn of Africa region: Assisted Natural Restoration. ICARDA’s researcher Claudio Zucca, a member of the jury, summarized the main aspects taken into account by the jury. Assisted natural restoration is widely and successfully adopted in Niger to restore tree cover in degraded savannah agroforestry systems. It is a traditional practice that is endogenous to the country, and which has proved to be effective to mitigate or reverse land degradation over large scales, and to increase farm income thanks to multiple tree products. Economic and ecosystem benefits are high in the medium to long term and are highly enhanced by the integration of this practice with accompanying measures securing sustainable cropping (such as soil and water conservation practices) in landscapes with restored tree cover. Using assisted natural restoration has shown to be cost-effective as the farmers use locally available plant material, preserving and promoting useful seedlings. It shows high rate of adoption and highest degree of ownership by farmers that learn how to promote multi-purpose trees (wood, fodder, fruit, manure, etc.) according to farm production system. 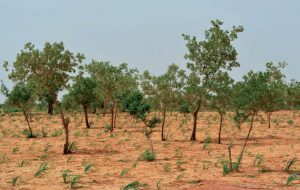 “This type of knowledge sharing exercises can show to be of use to governments and institutions involved in combatting desertification in the Sahel, to design their climate change adaptation intervention,” says Claudio Zucca.